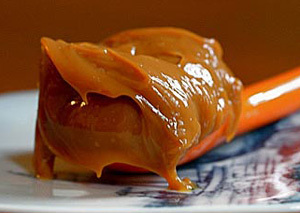 Dulce de Leche, a sweet found in Argentine, Uruguayan and Chilean cuisine, is prepared by cooking sweetened condensed milk to create a sumptuous sauce that tastes like melted milk caramels. I will warn you – it is dangerous. I could eat it out of the container with a spoon, but it can also be extremely versatile when used sparingly as a topping for healthier ingredients to make hundreds of fast desserts. Start with fruit, whole grains and low-sugar sorbets to make a low-fat treat that has more character with a dollop of dulce. You can buy a commercially-made version, but it can be a challenge to find in local grocery stores, so for my latest post on AOL’s Slashfood, I highlighted how to make your own. If you make a full batch, it stores well in the fridge and is an incredibly delicious low-fat sweet that you can use in a million ways. Get the full recipe how I made your own Dulce De Leche.